While you might not be able to conquer the whole Pacific Crest Trail Washington, you can explore parts it. There are several PCT hikes near Leavenworth, allowing you to enjoy the natural beauty. Tell me about the Pacific Crest Trail. The Pacific Crest Trail is a famous trail that goes from Mexico to Canada and boasts the greatest elevation changes of any of America’s National Scenic Trails. It travels 2,650 miles over a variety of landscape including deserts, mountains, and rainforests. Most people do not attempt to hike the entire trail in one set period of time. Instead, they slowly conquer different parts of the trail as they are able. What can I see and do at the Pacific Crest Trail? Mainly, you can hike. 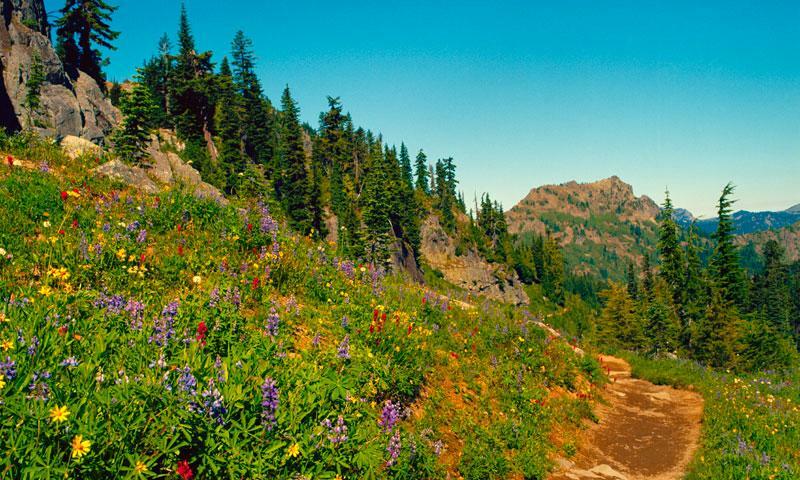 Because the Pacific Crest Trail travels from Mexico to Canada, you can enjoy one of these hikes that are part of the Washington Pacific Crest Trail and close to Leavenworth. Surprise Lake #1060: Part of the Central Cascades Stevens Pass West area, Surprise Lake Trail is an 11.0 mile trail, roundtrip. The elevation gain is 2700 ft. with the highest point at 2900 ft. This out and back trail is known as being the best area to see old forest growth along US 2. Josephine Lake: Part of the Central Cascades Stevens Pass East area, this hike is 10 miles roundtrip and can take approximately seven hours to complete. The elevation gain is 2150 ft. and the highest point sits at 5100 ft. Dogs are welcome on this trail. Pete Lake Trail #1323: Part of the Snoqualmie Pass Cle Elum Ranger District, this trail is 9.0 miles roundtrip. The elevation gain is 400 ft and the highest point is at 3200 ft. This trail is a good trail to bring kids on and you will have a chance to see wildflowers, mountains and wildlife. Call the Wenatchee River Ranger District at (509) 548-2550. You can also visit www.pcta.org to learn more about the trail.